For many applications, air as a motive force is a natural solution. Accudyne Systems, Inc. has developed state-of-the-art solutions using air to drive and control a variety of functions. At the most basic level, we regularly use air to drive cylinders in traditional “bang-bang” control schemes. However, through the use of electro-pneumatic regulators in closed-loop control we can provide control far exceeding the norm. 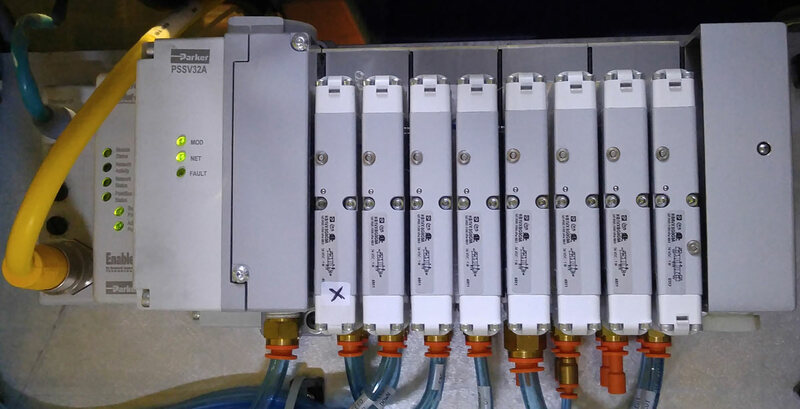 For the processing of thermoplastic composites, we use load-cell feedback to control an electro-pneumatic regulator. This provides fine control of the compaction mechanism in a continuous web processing line. The result is a consistent, low-void, high-quality product. We earned a patent for our innovation in the control of pressure for supercritical CO2 reactors. Our approach gave the customer the ability to market a low-cost, bench-top, laboratory-scale reaction unit. To date, over 70 units are in the field. By coupling our pneumatic controls with our other sensor capabilities we have developed a system to control air-motor speeds. This is beneficial for mixing operations requiring fine control and for operations where an electric motor is not appropriate. Although pneumatic control usually focuses on pushing something, we have also used it to provide accurate metering of vacuum. This applies to everything from vacuum acquisition of delicate parts to the precise controls of vacuum valves. Forget the old ideas of air being on or off with cylinders banging from one stop to the other. Let Accudyne show you how good pneumatic control can improve your process and raise your systems to a new level.